With the release of its sibling MP4-12C, McLaren commendably made entry through 2014 Geneva Motor Show. With its heavy power getting distributed through behind the seats, in no time it made a space for self in fastest vehicles segment and giving a good competition to cars from Ferrari and Lamborghini. Knocks year 2015 and company is out with little iteration inside and out and a new badge, McLaren 650S Sprint 2015 as a successor to 12C GT Sprint. Let us have a closer look at this unique model and get to know a little better it’s FIA-approved interior and track-spec engine. Interior of McLaren 65S Sprint 2015 will make you appreciate the incredible work done by company. While preparing interior company focused very much upon lessening the weight of 650S Sprint and thus they too-off all the unnecessary parts from monoCell chassis. Interior has FIA-approved rollcage and racing seats made from carbon-fiber and with six-point harness. For comfort McLaren has mounted a standard air-conditioning system while for safety a fire extinguisher has been integrated inside. Apart from this one thing that might bother you could be its availability with only a driver seat. However you have the option to have a passenger seat with same configuration as well. Another change you can make from option list is changing the regular windshield by a polycarbonate windscreen. Exterior of McLaren 650S Sprint 2015 is a production friendly design. Talking about similarities we do noticed bonnet and center piece holding roots in the standard 650S while the hood looks like to be carried from 650S GT3; yes with its vents and radiator exit ducts. Front bumper gets redesigned and now comes with race-spec inlet for better cooling. 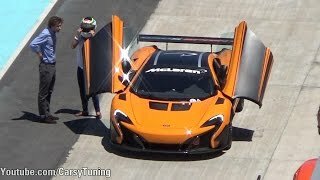 Moving towards the rear fascia of McLaren 650S Sprint 2015, first to grab your attention will be a massive fixed wing followed by race-spec diffuser giving some aggressive and track oriented looks. As an option customers do hold choice to go for rear wing and front splitter made from carbon-fiber, this change will majorly add to the performance of your 650S Sprint by lessening its weight. 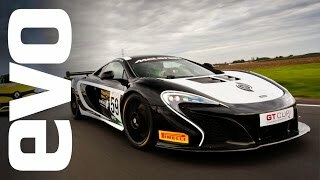 McLaren 650S Sprint gets its power through a twin-turbo 3.8 Liter V8 engine delivering total output of 640 hp and peak torque of 678 nm paired to seven-speed dual clutch transmission. 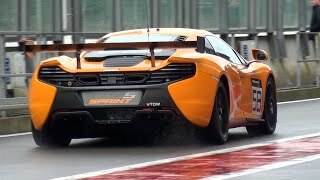 With its powerful engine McLaren 650S Sprint is capable f reaching 62mph from standstill in just 3.0 seconds while the top speed of model stands firm at 207 mph.